The Navy Supply Corps School Website Created in 1862 by John Gilleland of the Athens Steam Company in Athens, GA, this weapon was designed to simultaneously fire two cannonballs connected by a chain. Repeated tests demonstrated that although creative, the weapon simply didn't work. The confederate authorities decided not to adopt the design and no more were produced. 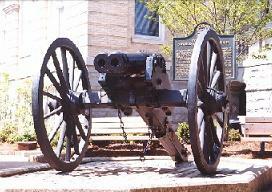 The weapon was returned to Athens, GA, were it was nominally designated as a signal gun (to fire blank rounds only). It now sits in front of city hall.